Publicans Darren and Helen Lawrence of the King’s Head in South Road, Hailsham, fought off some stiff competition to win the CAMRA South East Sussex ‘Branch Pub of the Year 2011’. This prestigious award is judged on the quality of their real ales, service, clientele mix, atmosphere, good value, and sympathy with CAMRA aims; that pubs should be considered as important centres of community life and places for informal social drinking. This Harveys tied house comes as a two-in-a-row win for the Lewes based Brewery with the Hurst Arms, Eastbourne, winning last year. The evening award presentation was attended by Miles Jenner, Harveys Joint Director and Head Brewer, who provided a ‘special brew’ for the evening called Brown Bess. Several CAMRA members from the branch along with the locals emptied the cask in under an hour. 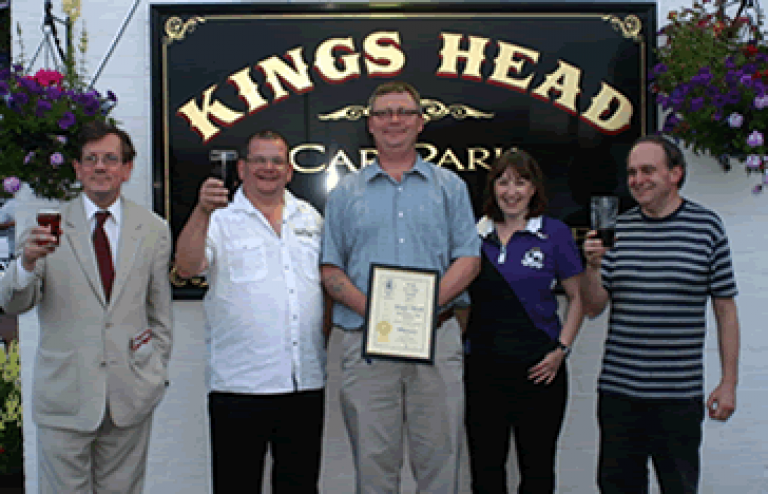 The award was presented by the CAMRA Chairman, Peter Adams and Vice Chairman Phil Cozens.